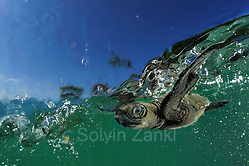 Solvin receives the Fritz Pölking Award 2010 for his story on the Arribada of the olive ridley sea turtle (Lepidochelys olivacea) in Costa Rica. The pictures are taken on the beach of Ostional in Costa Rica where turtles arrive for nesting all year round – even outside the typical season there is at least one of them every night. Three different species come here to deposit their eggs on the beach. It is one out of only four beaches worldwide where on some days up tens of thousands animals arrive for mass nesting in a so-called „arribada“. It is also the only beach where locals are actually allowed to harvest eggs for their own use. For three weeks Solvin appears on the beach at 3 o‘clock in the morning with his cameras ready to use both under water and on the beach. 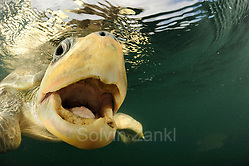 It is a great pleasure for him as he discovers the first 50 or so turtles‘s heads on the surface of the water at dawn. Minutes later the first Olive Ridley Turtles reach land, followed by the next 100, followed by a thousand, followed by…impossible to count them all. Like an anthill, it is a constant coming and going. 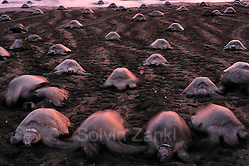 In the following days Solvin is not alone with the animals anymore; news of the event has spread and the turtles are joined by hundreds of locals who will be harvesting the eggs of this year‘s arribada for the next 36 hours, and thousands of tourists arrive on the beach by the busload. But despite all this, 50 days later many hatchlings will emerge to a dangerous start of a new sea turtle life. This entry was posted on Tuesday, November 2nd, 2010 at 9:35 am. It is filed under Awards, News 2010, Older posts. You can follow any responses to this entry through the RSS 2.0 feed.